The Haveli of Shrinathji, c. 19th century. The composition of this painting is elaborate and intricate. 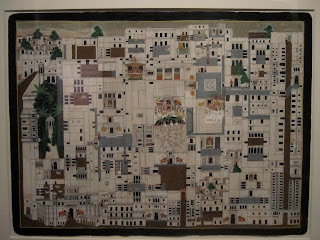 It is a topographical view of the haveli of Shrinathji (a temple where the deity Shrinathji, a form of Krishna, resides). The temple is in Nathdwara, near Udaipur in Rajasthan. The followers of Pushti Marga, a sect of Vaishnavism started by Vallabhacharya in the 15th century, consider this shrine as a holy site. The followers come from Gujarat, Rajasthan and Uttar Pradesh. However, many Indians living abroad follow this sect as well. 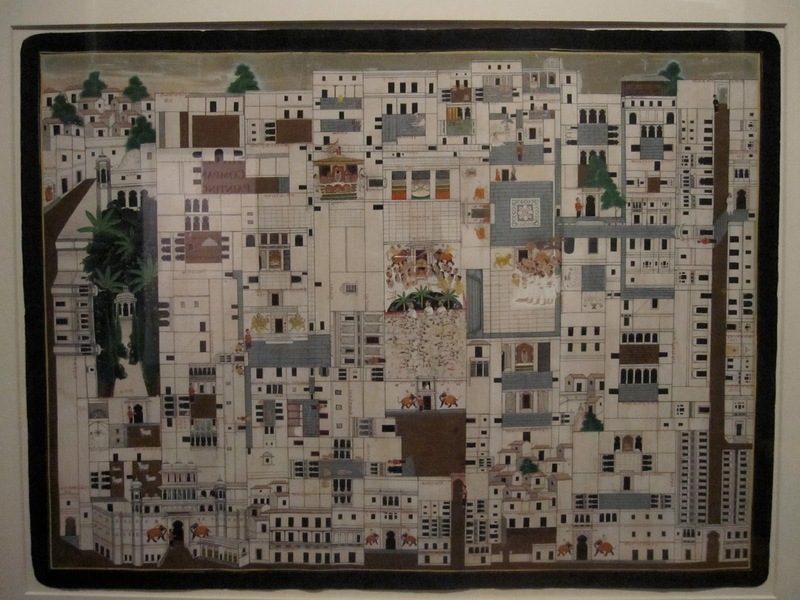 Pilgrims would acquire such paintings on their special pilgrimage to Nathdwara. The foreground of the picture shows the open square in front of the main entrance of the temple. After a series of courtyards and gateways, one enters into the main shrine at the Sun gate. There are many people standing in front of the image of Shrinathji. There are also many baithaks (seats) of Shrinathji indicated such as that of Madanmohanji, Mukundrayji and Gokulnathji. Even the kitchen, where an annakuta (elaborate feast) is being prepared, is indicated.